So, yesterday my girlie and I invented Luau Cake, a relatively healthy and incredibly yummy summer dessert. The original idea came from Pinterest (naturally), and a recipe from It’s On the Tip of My Tongue. 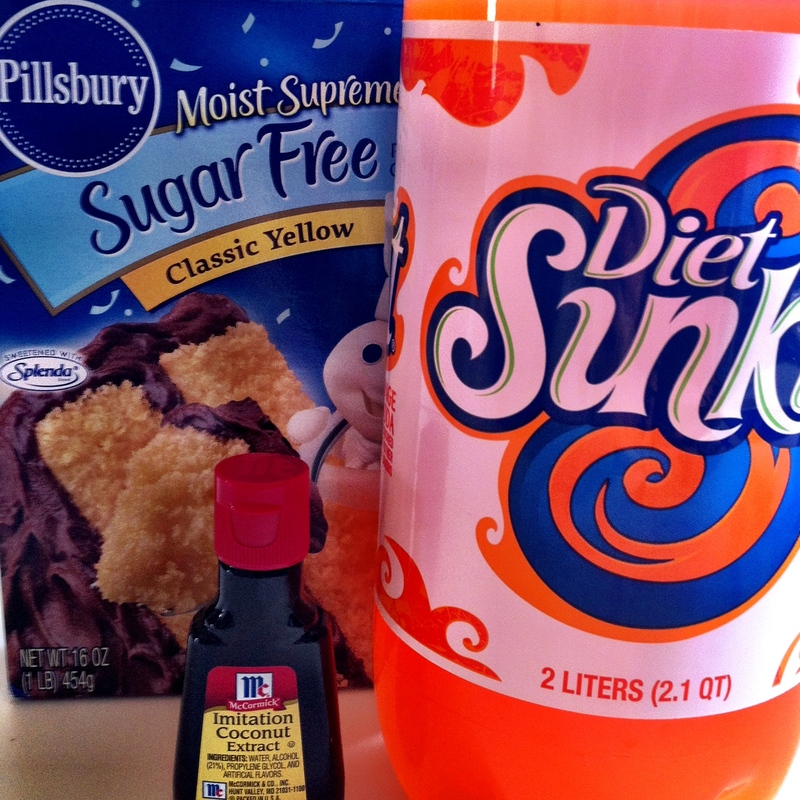 Blogger Sarah Rolf used a box of sugar-free yellow cake mix, diet orange soda, and a Cool Whip Light “frosting” to create a cake that apparently tastes like an Orange Cream Soda. Yum, right? I happened to have a dangerously ripe mango and some very soft strawberries hanging around, so I decided to expand on Sarah’s original recipe. My girlie and I preheated our oven to 325 degrees and mixed one box of sugar-free yellow cake mix (ignore the suggested ingredients like eggs, oil, and water printed on the cake mix’s packaging–you don’t need them!) with twelve ounces (one can) of diet orange soda and one teaspoon of coconut extract. 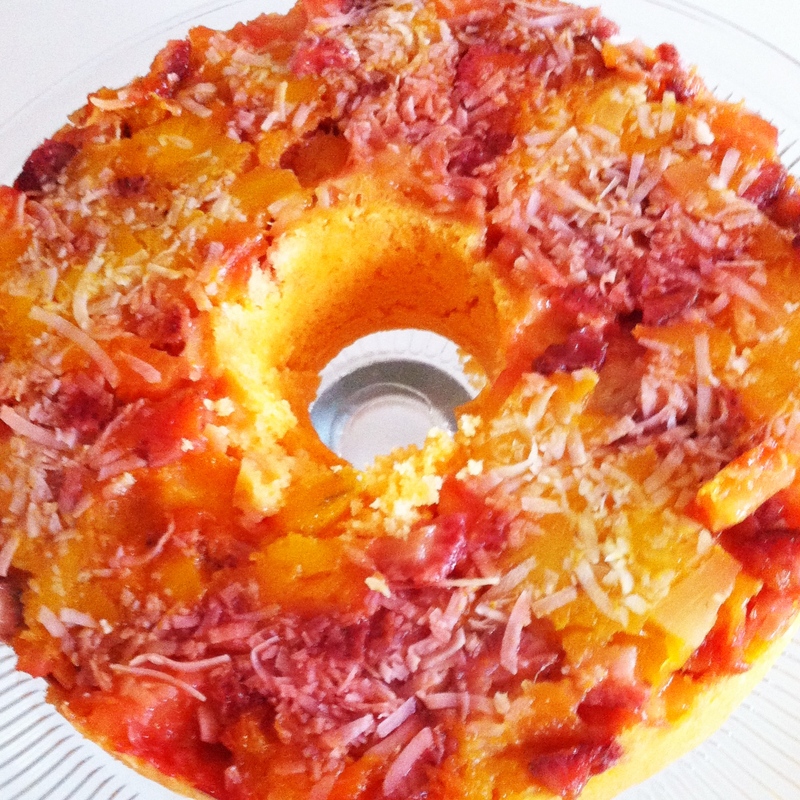 We sprayed a bundt pan with Pam, then sprinkled coconut flakes, fresh diced mango, fresh diced strawberries, and pineapple bits (the kind that are canned in their natural juices) so that the combined fruit just covered the bottom of the pan. 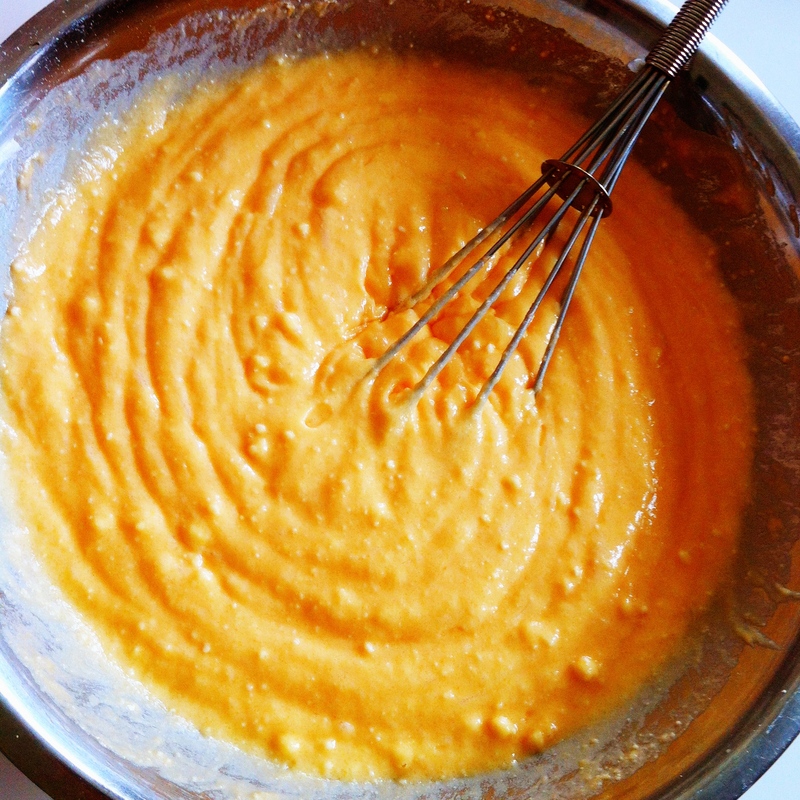 We poured the cake/orange soda/coconut extract mixture over the fruit. We baked our Luau Cake at 325 degrees for approximately 50 minutes. Keep an eye on your cake. You want it to be spongy and moist, not overdone. A toothpick came out of our cake clean when it was finished baking. Let the cake cool completely before carefully inverting it on a plate or cake stand. Look how pretty! We ate our Luau Cake with dollops of Cool Whip Light. 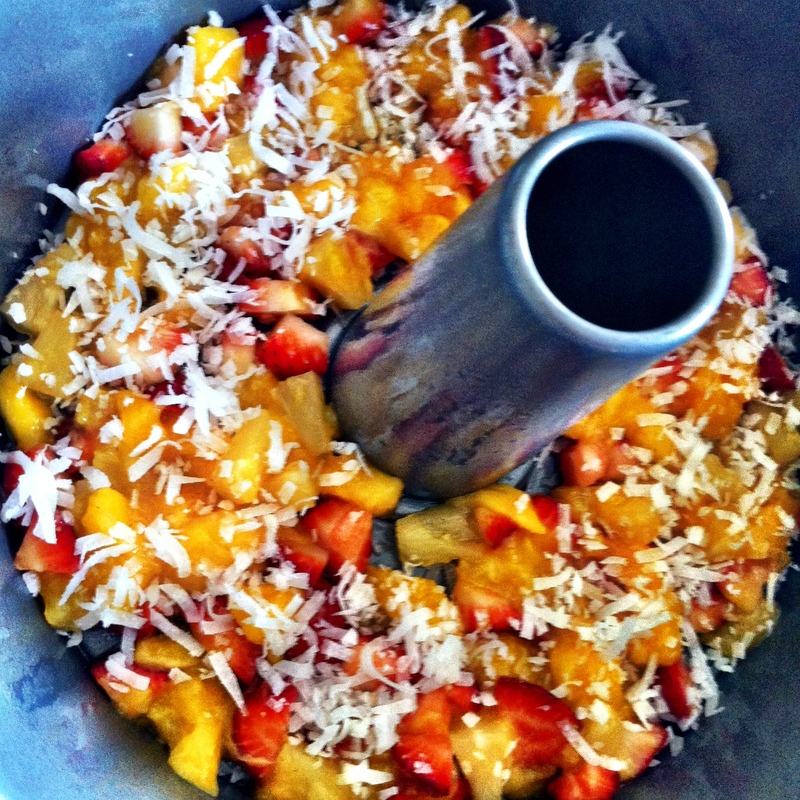 A sweet and easy summer dessert! Tell me: What’s your favorite sunny day treat? Chocolate chips cookies…any time of the year…been craving them…I think I need to make some today. YUM! How inventive and delicious 😀 I think I repinned that original recipe from you. Lol. I even checked out the sugar free cake mix in the store, but saw it was only 20 calories less than the original so left it on the shelf. It would be great to cut down on sugar though, which I tend to not do because I’m a glutton. Ha! You’ll have to let me know what you think if you try it, Carol. I think the next time I make it, I’ll use canned cherries, chocolate cake mix (not sure if it comes sugar-free?) and Diet Cherry Coke. Yum! Wow, that looks awesome! Thanks for sharing! My favorite summer treat is icebox cake–whipped cream, Nabisco chocolate wafers, and (optionally) some delicious fresh berries, and BAM–it’s like cake and pudding all at once.